What are stomach ulcers in horses? An ulcer is an area of the stomach where the tissue is damaged and eroded. The term Equine Gastric Ulcer Syndrome (EGUS) is used to describe this painful and common condition in horses, which affects the stomach and the first part of the small intestine. Since horses are grazing animals that are intended to graze most of the day, their stomachs constantly produce acid. Because they are typically fed concentrated diets a few times a day, horses are more susceptible to acid buildup, eventually causing ulcers. Equine ulcers are the result of a repeating cycle of increased acidity, decreased appetite, and the formation of an ulcer—followed by moderate to severe discomfort. Often the result of stress, which causes an increase in stomach acid secretions that damage the stomach lining, ulcers are painful and lead to an aversion to eating. Eating less roughage causes the horse’s digestive tract to become more and more acidic, leading to more ulcerations, appetite suppression, and pain—and the cycle continues. 1. McClure SR, Carithers DS, Gross SJ, et al. Gastric ulcer development in horses in a simulated show or training environment. JAVMA. 2005;227(5):775–777. 2. Murray MJ, et al. Factors associated with gastric lesions in Thoroughbred racehorses. Equine Vet J. 1996;28:368–374. Ulcers in horses frequently result in colic, a painful and persistent condition. Read more about signs of ulcers and how they are diagnosed. 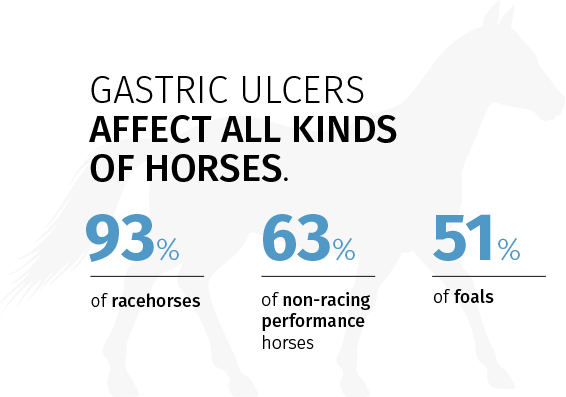 The treatment and prevention of ulcers in horses has recently evolved to include controlling gastric acid production, rather than simply neutralizing it with antacids. The result is faster healing, and less pain and colic.